A photo competition is taking place in Ellesmere Port and the winning entries will be displayed in a charity calendar on sale later this year. Profits from the ‘I love Ellesmere Port’ calendar will go to Macmillan Cancer Support, chosen by the Mayor of Ellesmere Port, Councillor Lynn Clare. Email your entry to ellesmereportsp@cheshirewestandchester.gov.uk and the deadline for the competition is October 1. The contest has been organised to showcase what the town has to offer. The Vision and Strategic Regeneration Framework (VSRF) of the Ellesmere Port Development Board includes, as an overarching objective, making people proud of Ellesmere Port as a place to live, work and visit. Both the competition and the calendar will highlight the great things happening in the town. All entries of last year’s photo competition were printed and exhibited at Trinity, with the five winners and five runners up displayed in large frames, first at the Paperboat Gallery, and later at The Port Arcades shopping centre. The Mayor of Ellesmere Port, Councillor Lynn Clare said: “This competition will show what Ellesmere Port has to offer, as well as making sure that the winning pictures will be displayed in homes and businesses and not only that but raise funds for a charity very close to my heart. What could be better? “Twelve photos will be chosen and the charity calendar goes on sale in December. This year, the project will benefit from the expertise of the Ellesmere Photographic Society when selections are made for the calendar. The www.ellesmereportphotographicsociety.co.uk holds meetings on Monday evenings from September to April. 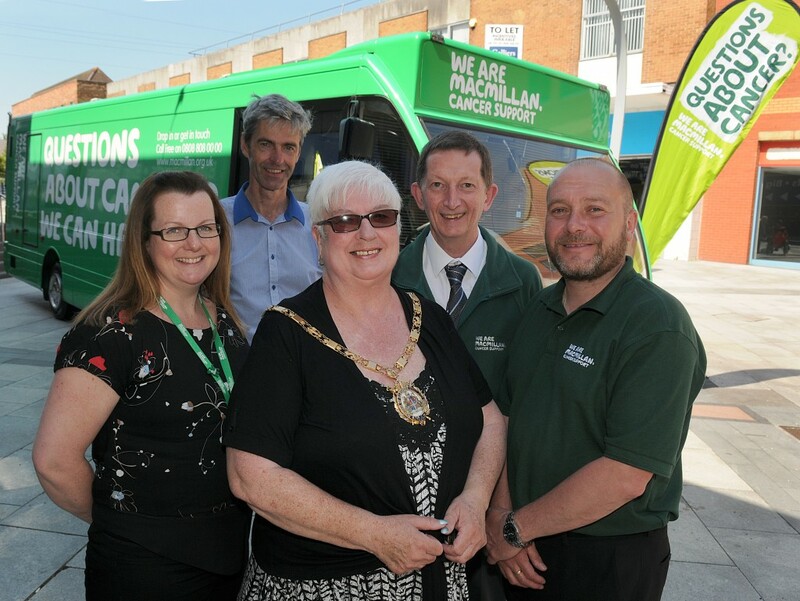 The ‘We Are Macmillan Cancer Support’ information bus with Helen Whitley (Macmillan Information and Support Specialist), Jochem Hollestelle (CWaC), Mayor of Ellesmere Port Councillor Lynn Clare, Geoff Greig (Macmillan Mobile Facilities Officer North), Michael Lockey (Macmillan Information and Support Specialist).